How do you share links, resources with your library patrons? In the past, the default option would certainly be through email. There is nothing wrong with sharing links through emails, though it seems to me a more structured and organized way would be better. But today with the rise of social networks, collaborative tools and general web 2.0 love, there are a bewildering number of online sharing options, I thought it would be useful in this post to briefly consider each class of tools and assess their suitability. To give us something concrete to work on, let us assume you arrange to meet with a graduate student to discuss his research topic. From then, on you want to regularly send his interesting resources you find. You can assume he has the same access to resources you have (so a direct link with ezproxy stem built-in would work) but you cannot assume he has registered for whatever service (including citation managers) you intend to use. Of course, this scenario is just a smaller scale version of the task of creating subject guides, so many of the same solutions can be used. The tools that I will cover below will generally generate a list of resources you shared on a webpage (which may or may not be password protected). Depending on what type of librarian you are, you may be sharing mostly link to free public sites, or to links to academic journals articles in subscribed databases, and this impacts the type of tools you might use. (1) Handles links to password protected pages – In particular many general social bookmarking tools work fine with normal webpages but fall down when you try to handle links from subscribed databases which require logins. This is particularly so for tools that try to archive the page or add annotation overlays (see below). 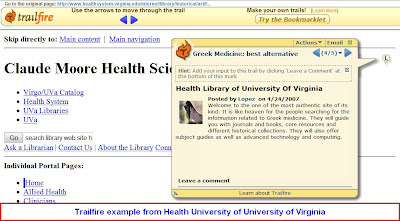 (2) Allow exporting of citations in several formats – Most of the resources you are going to share are articles, so ideally the webpage that displayed the resources would be formatted in such a way that allows your library patron to easily export the citations in various ways (RIS, text, BIBtext) to whatever citation manager they prefer. (3) Allows resource lists to be embedded in other spaces – The resource list should be exported as RSS which would allow you to create widgets using external services such as widgetbox to embed in other pages (including wikis, social networks, startup pages etc). Even better would be for the service to provide it’s own widgets such as delicious linkrolls. Diigo offers the very interesting WebSlides. (4) Allow you to add annotation/comments – This could be an overlay of your comments over the webpage in question, or simply allows you to add comments next to the citation. (5) Allows collaboration (real time?) – Ideally the user could add comments like “This is good”, “This is not relevant because…” etc. 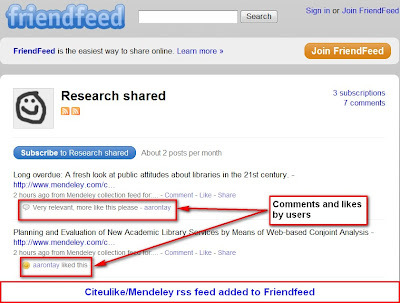 Better yet if the tool has a “like” feature as seen in Friendfeed and copied by facebook, google reader – allows you to get quick feedback what kinds of citations are relevant. (6) Allows access without registering for a account – While (4) assumes to some extent that users will have to log-in, you can’t assume that the user will want to go through the pain of registering a new account just to view your list of resources. I would add that it is the whole process of REGISTERING (which typically requires that you fill in a long web form) that is annoying, a password protected list, where all the user needs to do is to enter the password you supply might be acceptable. The most famous of this is of course Delicious. 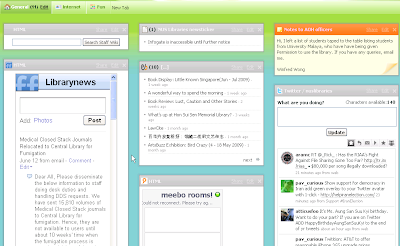 Newer and more trendy alternatives with many more features include Diigo, Twine, Google bookmarks and more. (Not sure if “Readitlater” type of tools like instantpaper might be used). These tools were never designed in mind for academic use, though they can be readily adapted to such uses. Typically, they allow users to access resource lists without authentication, which reduces barriers to entry. The main disadvantage is that as they are not designed for academic use, they don’t provide various niceties that web-based citation managers have including formatting of citations, links to resources via doi, coins etc. 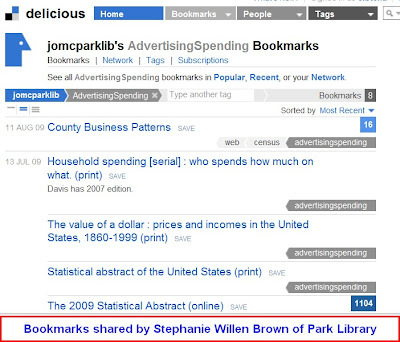 Many of the older social bookmarking tools like Delicious also provide relatively little social networking functions. 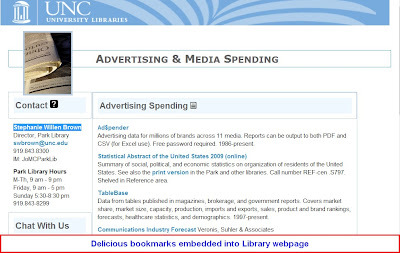 Delicious does allow you to add fans and/or export results to rss feeds though which allows you to create link roll widgets to embed on your webpage (see library subject guide created using delicious link rolls), but they definitely don’t provide anyway for the user to add comments to the resources you share. Try Diigo or Twine if you want the ability to add comments. One can also consider “clipping” software/services like Evernote, Zoho Notebook which can store anything you can imagine, but it’s can’t clear how good the sharing features are. The idea of annotating webpages goes back to a 1999 outfit Third voice. The idea is that you install a browser plugin of some kind, then you can view comments or annotations left by other visitors of the page. Comments or annotations are usually overlaid over the existing page, or in some cases, a separate frame opens with comments about that page at the side (some will even pull comments from Twitter, friendfeed about that page). This is a very crowded space with many alternatives including A.nnotate , Awesome Highlighter ShiftSpace, Fleck, Stickis, TrailFire, SharedCopy, webnotes, Reframeit and more. A few libraries have started to use TrailFire to guide users. Below is an example from Central Pennsylvania College library which they use to annotate pages to guide users through their webpages. 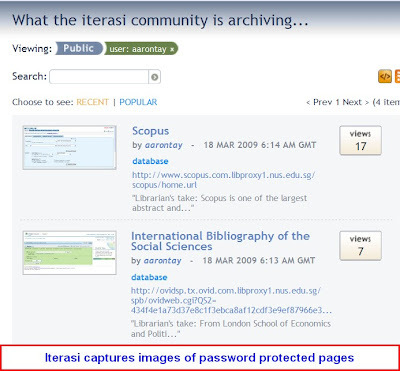 More traditional social bookmarking tools like Diigo, Iterasi, Qitera, also incorporate archiving of the existing page with comments/annotations and images captured. Diigo in particular has an interesting WebSlides feature. Being able to add annotations seems useful. Imagine not only linking to a specific article, but also highlighting sections that you find relevant or interesting. Imagine being able to engage in a conversation with a user about an online article, by scribbling in the margins. The main problem with almost all web annotation tools is that they don’t really work with links to subscribed databases as they are typically accessed behind a password with the added complication of ezproxy links, and as such web annotation/archiving features fail. Iterasi seems to be the only one that is capable of doing so, though I’m not sure of the copyright implications. Since we are typically sharing articles, why not use a tool designed for it? While desktop based citation managers are still popular, in recent years, many web-based citation managers have began to appear, and desktop managers have added web-based versions or at least allow sharing to users who are using the same citation manager. In addition, designers of citation managers have become inspired by the success of social networking sites and have began to mimic such sites by adding features that encourage collaboration, finding people in similar fields etc. 1) 100% web-based, delicious-like tools (e.g. Penntags, Connotea, Citeulike, 2collab, refworks) , these generally focus on uploading your citations and to varying degrees sharing with users but don’t have “cite as you write” features to aid writing of your thesis. The main thing I’m looking for here in such services is the ease at which you can share resources, typically links to articles. Connotea, Citeulike and Zotero, Mendeley are either completely web-based or allow you to push lists of resources to a web-based site, which does not require users to login to view. 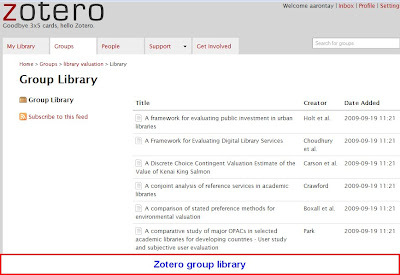 Typical examples would be Mendeley’s public collection or Zotero’s groups. 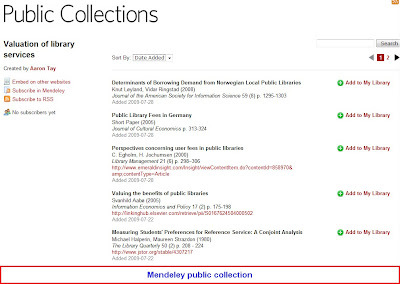 Note: If you want to share pdfs or full-texts you can use Mendeley’s shared collection option instead. Citeulike is probably even better since it’s web-based page allows exporting of citations in various formats including RIS, txt, RSS etc. RIS is particularly important to support since most citation managers support that. Somewhat less ideal is EndNote, which allows sharing only between users of EndNote web. Of course, you could just export selected Endnote citations into txt and then email the list to the user. I have written quite a bit about using rss feed reader as a discovery tool. You can use Google reader to share with users, or post to a shared item page for those who don’t have a account. Added plus, users can give feedback by liking it. One disadvantage is that you run into problems when you are trying to share to more than two persons. You can have a public page of (1) Your starred items (2) Things you shared (and (3) specific folders) but what if you need to share to more than 2 users? 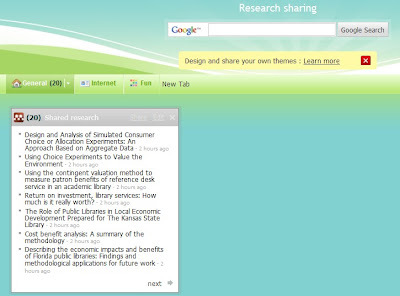 #5 Collaborative tools – wikis, google docs etc. Of the tools managed above, most of them have few collaborative capabilities. If you intend to collaborative on a long term basis, chances are you might want to go with either tools that are designed along such lines. The first major class would be wikis of course. In addition, there are collaborative tools such as etherpad, google docs, Zoho Office, Buzzword etc. Then there is the possible game changer Googlewave. These are web-based word processors that allow several people to collaborate on at the same time, changes can be seen in real-time or near real-time. The chief disadvantage of such tools is that the input is unstructured. #6 Blogs – e.g. Posterous, Tumbler. Anyone tried using blogs to share resources? One could use widgets to pull in data from any one of the earlier classes of services and then allow users to comment. “Light blogging” platforms like Posterous, Tumbler might also be used, due to the ease in which you can bring in data from various sources (including just emailing it!) and to push them to other sources. Odd ideas, use the email options in databases, to post straight to Posterous? I have never heard of anyone trying this, but in theory you could set up special facebook pages, or Friendfeed rooms to share resources. Both services, make it easy for users to comment, “like” entries and provide real-time updates. 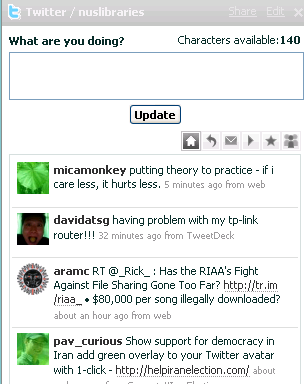 Friendfeed is similar to Posterous and provides half a dozen ways to bring in information, and to export the stream. Another interesting feature about Friendfeed , you can share files! Many libraries are experimenting with Facebook pages. I have limited experience in this area, but I wonder if one could use facebook pages as a sort of subject guide, or more specifically to share resources to specific users. Startup pages is another topic I have written a lot about, though I have typically written about it in terms of being a general subject guide, rather than being a specific resource list for a specific user. I’ve probably left out, several other ways you can share resources, feel free to leave comments on how you share resources. First, a look at the final product. Recently, I have being thinking about how information flows in a large organization, including libraries. In my last post, I talked about two methods in which one could quickly aggregate critical information that are sent internally in libraries by email to a “information dashboard” (I note with embarassment that I’m probably misusing this term) . I noted that sending mass emails to everyone’s inbox was not a good idea, because people might just miss the email. Wikis would be an answer, but it is unrealistic to expect wikis to be updated instantly upon being sent an email, and there was a need to keep track of such emails to ensure that the wiki was being updated. My idea was to forward the email to a service that would accept input from emails and aggregate the result in a nice format. Further more, one would then pull that information and other useful information via RSS into various services such as Netvibes, Igoogle, etc. The librarian would then consult that page when on duty at service points. The first solution (using Individurls) looked like this. The more I thought about it, the more i realized this wasn’t a particularly good idea, because RSS feeds can take 20 minutes to update and the whole idea was to be updated in as near-real time as possible. Was there a real-time alternative? I looked at XMPP, SUP but it was too difficult. I did talk about Friendfeed in my last post , on how one could send an email and it would update friendfeed, but I suggested that people refer to the page at the start of duty and then either refer to that page constantly or install FriendFeed Desktop notifer to be informed of new posts. But I missed the obvious, elegent solution! Why not embed the real-time widget Friendfeed offers into Netvibes, Igoogle? To recap, here’s my idea. 1. 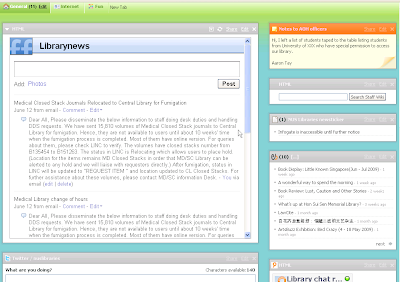 Set up a special Friendfeed account for internal use for the library and keep it private. 3. Now embed the real-time widget into Netvibes, Igoogle, etc. 4. Then add any other useful widgets to that page and use it at the service desk. It works really well, when I mean real-time, it really means that. Send an email from a registered account to a certain email address or update Friendfeed directly and it updates on Netvibes page instantly without reload! If lots of librarians in your organization use Friendfeed, you might one to embed a Friendfeed group (formerly room) instead. If no-one has their own Friendfeed account, they can still use friendfeed to communicate (they will all be using the same account, more than one can be logged in from different locations to the same account), but you can’t tell who is saying what, since it all comes from the same account. A group gets around that problem. I can’t really talk highly enough about using Friendfeed this way, as it’s really flexible. If you don’t want to look at the netvibes page or the friendfeed page, you can setup to be updated via IMs, emails, RSS , Facebook, Iphone or download their own Friendfeed notifer. You can also update friendfeed using email, IM. So it is suitable for librarians who have different comfort levels for technology from the geeky librarian who is god at Librarian2.0, to those who just use email. Of course, when you use AJA startup pages like Netvibes you can be as creative as you one and add widgets to centralize all kinds of information needed by a Librarian at a service point. I prefer to use OpenSearch plugins in my browser to quickly search commonly used services, but for people who don’t have this habit, you can provide simple search widgets using the method I blogged about here on how to create almost any search widget with no programming or scripting skill required. For me, I’m thinking of adding search widgets to search our internal wiki for policy, telephone directory of my University etc. If your organization uses Twitter/Meebo or any web-based chat widget either for internal or external use, you can embed widgets for those. Though these do not update instantly, it does not hurt to add them. I add our own external blogs, news page etc. One could also add the rss feeds to the Friendfeed account of course, but I personally prefer to leave the friendfeed account clear except for critical information sent through email. I’m sure there are tons of interesting widgets one could add. Though one can use the friendfeed widget to communicate, probably that isn’t the best use. For simplity, I like the webnote widget from Netvibes for instance.Then one could quickly leave notes to the next officer at the desk. Perhaps even better would be something that provides real-time collobration , etherpad , googledocs or better yet the coming Google wave! 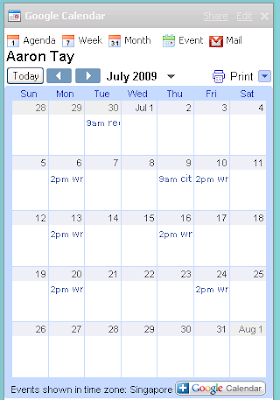 Another obvious idea you could also add online calenders, those using ical, google calenders etc. 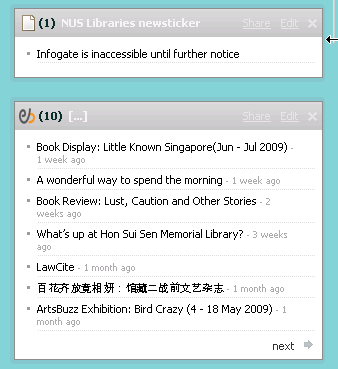 Haven’t quite worked out the logistics, but using Netvibes, one can share the page with several different Netvibes accounts, or one can share each widget, so each librarians can customize their own Netvibe pages they want to use at the service points. Other librarians who don’t want to, can just use the default. I’ve always being remiss in acknowledging where my ideas come from, in this case, I believe my idea was inspired from real-time blogging with Friendfeed . Also I remember seeing either a Tweet, or throw away comment by someone about using Netvibes for librarians at service points, but try as I might I can’t find it. My thanks to both for their creative ideas. Librarians are often overwhelmed by the mass of fast moving information they need to keep track of. Particularly in large libraries for librarians manning information desks, keeping up to date with the latest changes in policy and instructions is often a challenge. One can use Wikis, or tools like Etherpad to manually update a “news page” or to make changes to the documentation, but often the latest changes and news is propagated through email from top management who are too busy to update the wiki. You also don’t want to update the wiki with something that is of short term utility and won’t apply after a week. In the past, I used to just move these emails into a “policy” folder but that was unwieldy. Not to mention the fact that I would often miss such emails among the crowd of other emails in my inbox. A natural idea here is to try to create a information dashboard for librarians manning information desks that puts essential information at one place. (2) It would bring together data about the latest changes in Library policies, things to take note of etc. In this blog post, I’m more concerned with (2) – a future post might address (1). What is the most effective and efficient way to manage such information? The idea here is to setup something that is light weight, easy to use for all librarians of different skill levels. Ideally they would scan this information dashboard before they started their duty to remind themselves of the latest information. One would of course set up desktop widgets using Google desktop, Yahoo! widgets etc on the computer used at the service point, but that would not be a very simple solution. You can also have a poor’s man desktop widget using Active Desktop (Windows XP) , an idea I might cover in a future post. The other option would be to use web-based startpages like Netvibes, Pageflakes or Igoogle etc. The idea is simple of course, get the updates you need in RSS, and then feed it into the start page. You could get the RSS feeds of your news portal (or do screen scraping if required), calender events etc (ical to rss) and put it into whatever startpage you like. Some other odd ideas, how about pulling in your internal Twitter accounts used for communication , so one can leave messages for whoever is taking over next? In this blog post, instead of using the usual suspects such as Netvibes, I used Individurls – a service that displays RSS feeds. There are other choices but I chose it because of its simplicity and elegent displays. Okay it’s obvious what to do with RSS feeds and you can feed news sources if they come in RSS, but what about emails? My institution has access to Confluence Wiki, a enterprise level wiki which allows you to generate RSS feeds of any page, including “news” pages and “mails” pages. What “mails” does is that you set up a POP/IMAP account with Confluence wiki, and any emails sent to that email account will be posted on the Wiki. From there, one can then generate a RSS of that mails page and pull it into Individurls (or any RSS reader or display widget). If your wiki is password protected you will need to set up your RSS feed with the user name and password string. So all you need to do is to tell people who want to send important internal mail to cc that email address, and the information there will be automatically posted. Here’s how it will look like. No access to Confluence Wiki, or any Wiki that has this feature? 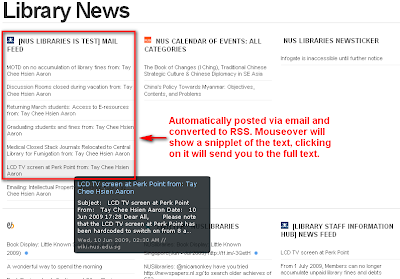 You can try services like MAILtoRSS , or any service that accepts input in emails but can output in RSS such as Posterous. I’m sure there are others. One thing that concerned me was the delay involved. While the email to RSS portion seems to be negligible , RSS feeds takes a while to update (and even more delay if you need to do screen scraping). I did some testing and it can take about 10-20 minutes to update via RSS. I tried using Pingshot service from Feedburner (similar service is Pingoat.com and more here), which speeds up updates to selected services, including MyYahoo! . MyYahoo! incidently allows you to display RSS feeds so one can burn feeds using Feedburner, turn on the Pingshot service and plug the resulting RSS feed into MyYahoo! In theory, this should speed up RSS updates. But it was still slow to update in my testing. How about using Friendfeed? It is already set up as an aggregator of feeds and unlike RSS feed readers it displays images too. On top of that, the page autoupdates in real-time, so you can keep it open and watch without reloading. You can also update FriendFeed using email and that will show up immediately on the Friendfeed page. First register/update the email addresses you will be updating Friendfeed with (you can add more than one). From the registered account, you then send an email to share@friendfeed.com, and “The subject becomes your entry title and anything in the body of the email is posted as a comment. You can even attach a photo to be included in your post”. You can also, install the FriendFeed Desktop notifer, which will pop up whenever it receives something new. This gives you both a page listing the recent changes, as well as instant updates via a popup. When you start duty at the service point, you go to the Friendfeed page to refresh your memory about the latest news. The information there will be updated in near real time if it is pushed via email. You can continue to monitor that page, or you can just rely on the FriendFeed Desktop notifer to update you instantly of any other changes that occur while you are on duty. Once a month, someone reviews all the news and decides which ones if any, should be updated in our Wiki. We recently started a small scale experimental presence on Friendfeed (official announcement) . Friendfeed is one of the most popular life-streaming services out there. I was curious about whether libraries were using such services and did a small survey on it. More on that later. In today’s world, one person might be on Flickr, Facebook, Friendster, Slideshare, Youtube, Delicious or a hundred other different web 2.0/Social media accounts at the same time. Lifestreaming services aggregates all these accounts into one central place, for interested people to follow. Wired in Dec 2008 claimed that Lifestreaming is one of the web technologies of 2008 that you should be using now. For a brief description of how typical lifestreaming service work see here. The lifestream blog provides a comprehensive review of the latest state of art in Lifestreaming. Given that libraries are currently reaching out to user communities via blogs, Facebook, Flickr, Delicious and a myraid other social networking/media accounts, it seems natural for them to consider using lifestreaming applications to provide a centralized location for all these accounts. There are many lifestreaming applications out there (see list and comparison), though it is still early days in this new area, Friendfeed (by an ex-googler), is currently the industry leader (though Facebook has recently added similar functions). I was curious to see how many libraries have started Friendfeed accounts and so I did a small experiment. I searched Friendfeed for accounts with the word “Library” or “libraries”. I filtered out as best as I could accounts that clearly wasn’t Library accounts (for some reason it gives me accounts where library doesn’t appear in the account name? ), excluded accounts that had no updates, and left out accounts where the feed was private (still testing)? In the end I ended up with 15 accounts.A couple seemed to be in testing/experimental modes though they all had at least 10 updates. 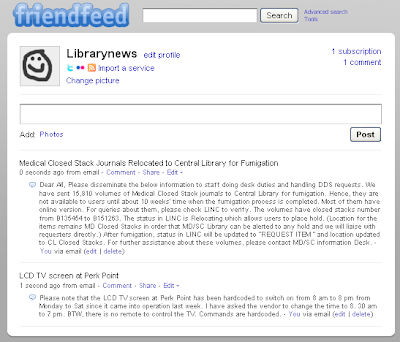 What are libraries doing with Friendfeed? It was quite fascinating looking at the friendfeed account of each library. You get a quick snap shot of what web 2.0/library 2.0 activities each library is engaging in and I already see some interesting ideas that I didn’t think of. I also uploaded the data into googledocs here , feel free to edit. One obvious thing I did was to see what web 2.0 accounts libraries were linking to in Friendfeed (I didn’t check if they actually had updates from those accounts though). Also if they had more than more accounts of the same service (say 2 blogs or 2 Flickr accounts), I counted them once. Do note that the diagram above is not representative of what libraries are doing in the web2.0/socialmedia arena (for that see this). 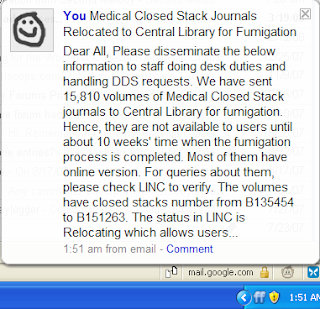 Rather they show what libraries who have Friendfeed accounts (who are likely to be early adopters) are doing. Out of 15 accounts, 12 accounts have blogs. 11 accounts Twitter, 10 have Flickr account, 8 Delicious, 5 Youtube, 3 Slideshare, 2 Facebook, Librarything, Gtalk and a scattering of the rest. There are few surprises, though I’m mildly surprised Slideshare (and similar services) are not used more to share presentations (think library tutorials). Though Twitter is getting a lot of press, it is still a technology that libraries are getting grips on (more info here, here , list of twittering libraries), so I suspect the large number of Twitter accounts here only reflects the fact that Libraries on Friendfeed are obviously early adopters. Using the classification of social media services found here , we can see libraries are basically using blogs, microstreaming services (Twitter, Plurk etc), photo sharing sites (Flickr, Picasa etc) , social bookmarking services (Delicious, Diigo, Twine etc). You can probably write an entire book on how libraries can use each category of social media service to reach out, so I won’t try at least for now. But viewing social media services in such categories, one can suddenly see a lot of ways in which libraries can creatively use social media that we currently aren’t using. For example how about using events related services like Upcoming , or calenders 2.0 service to publish library events? Geo-location services like Brightkite to keep patrons updated about your location? 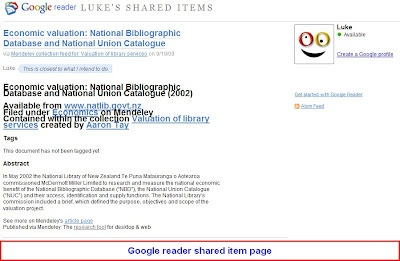 Sharing documents via Google reader ? Lifestream services accept any kind of RSS feed (some might even accept ical format for online calenders?) , so you can add content as long as it is in RSS format. For example, we currently convert our “new additions to libraries” into RSS format and push it to our Friendfeed account. If the content you want is not in RSS format, you can try using a data/feedscraper to convert a static webpage into RSS. I recommend Dapper. The lifestreaming arena is still in a state of flux and understandably libraries might want to adopt a wait and see attitude. It is possible that Friendfeed and similar services will die off as standalone services as Facebook adds similar feature . On the other hand, maintenance of Friendfeed accounts is comparative light compared to a Facebook account. If you are already running several web 2.0 accounts, friendfeed adds very little to the burden, once you set it up and link to your other accounts. Just continue to post pictures to Flickr, bookmarks to Delicious, make blog posts and your Friendfeed account will be updated automatically. Even if users don’t use it, you can also aggregate all the content through Friendfeed and embed it into your Library portal via a widget. Keeping track of interesting and cool ideas that might be used by libraries for benefit of users. DISCLAIMER - Opinions and views expressed here are strictly my own and do not in any way represent the position of NUS Libraries. Aaron joined NUS Libraries on 27 Aug 2007. Some of the hobbies he had in the past including geeky past-times like Chess, Computer Chess, IT security, Science fiction. Bayesian filtering of RSS feeds – can you automatically find interesting journal articles?